Google Page Creator is a service from Google that allows users to create and publish their own attractive web pages, quickly and easily by using a free, easy to use and browser-based tool. Google Page Creator is very helpful for users who’re non-technical and not familiar to web site creation, to easily set up their websites in What You See Is What You See (WYSIWYG) rich text editor mode, just like creating a document in Microsoft Word. If you would like more control over your web pages, you can edit the page in HTML mode too. Once you’re done editing the page, just 1 click will publish the page to the Internet at googlepages.com subdomain, i.e http://userid.googlepage.com/. Each user is given 100 MB free web hosting space and storage space. Google Page Creator’s Page Editor has a simple interface that automatically inserts the user’s Google user name as the headline on the home page (“User name’s Home Page”) – Google Account is needed to use the tool. Below that are a pair of boxes for inserting a subtitle and text, plus a third box for inserting optional “Footer” information. Buttons across the top of the work page provide the functions of “Back to Page Manager,” “Publish,” “Preview,” “Save,” “Redo,” “Undo,” “Change Look,” and “Change Layout”. Controls along the left side provide functions for inserting an image, inserting a web link, fonts, paragraphs, headings, subheading, “minor” headings, and editing the Web page html itself. Beside, Google Page Creator has Auto-Save feature like Gmail, to minimize changes of accidental loss. Page Layout can be changed by using Change Layout button, which will show you available layout. For each layout, the dashed rectangles represent the parts of the page that you can edit. Page Look can also be changed by clicking on Change Look, which will lead you to available designs and looks. Currently there is no ads on the web pages that users created. The page is saved and published accurately despite the service still in Google Labs. 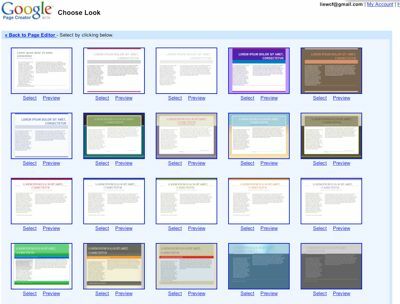 Google Page Creator also copies feature from Picasa, where you can tell your friends about your website by using Gmail. One significant downside to Google Page Creator is that when you save and publish your web pages with Page Editor, it will remove some of the HTML elements, such as <script> and <embed> elements in HTML code, even if you using HTML editor to edit your source code. Build your website with Google Page Creator. Note: Google Page Creator has been migrated to Google Sites.